O’Toole’s second stint as Mussels manager gets under way in England’s oldest cup competition against a fellow Southern Combination League Premier Division outfit. With Shoreham tipped for a successful campaign, O’Toole has downplayed any over excitement at the club. 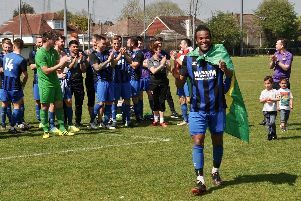 Having revamped the whole squad, bringing in players with vast Southern Combination League and Ryman League experience, Mussels’ boss believes teams will be gunning for them, starting on Saturday. He said: “The FA Cup is a great competition and one we want to progress in. “But I’m not looking any further ahead then Saturday’s game. “If I’m honest, I don’t really get too bothered about how we play it’s just about winning games, starting on Saturday. After Saturday, Shoreham’s attentions then turn to the Premier Division with a home clash against Hailsham Town. Despite adding a wealth of experienced and quality players over the summer, O’Toole is setting no targets other than winning the next game. He added: “I never look further ahead than the next game in front of us. “I think every team we play this season will want to beat us. “People have been saying we’re going to run away with this division but I see it completely different. “All I want us to do is to make sure we win the next game that is put in front of us. One signing who will not be involved in the season start is recruit Jack Rowe-Hurst. The 18-year-old damaged knee ligaments during Mussels’ pre-season friendly with AFC Varndeanians. O’Toole admits he will be a big miss and felt disappointed for the young winger. He added: “I really feel for Jack if I’m honest. “He got injured during our friendly with AFC Varndeanians and hasn’t been able to play since. “He’s been coming in and doing some bits with the physio but that’s about it. In: Rob Boddy, Devante Davis, Jamie Cradock, Fred Foreman, George Gaskin, Mitchell Hand, Scott Packer, Joshua Heyburn, Jack Rowe-Hurst, Joe Keehan, Kevin Keehan, Josh Measor, David O’Callaghan, Niall O’Hagan, Rob O’Toole, Andrew Pearson, Elliott Quant, Ryan Stevens, Ryan Storrie, Mark Zydonik, Jack Hartley. Out: All of last year’s squad.